Fifty years ago, Dr. Martin Luther King Jr., looked to our city, Newark, New Jersey, and other urban communities and explained that the country consisted of “two Americas,” divided by race. Shortly before his assassination in Memphis, King visited the City of Newark. He spoke at South Side High School, now known as Malcolm X Shabazz High School, and he visited the home of Amiri Baraka. King began to confront the idea that some of the same folks that were willing to sit down with him at lunch counters in Montgomery were not willing to stand with him against poverty in Newark. He articulated that while many willingly sacrificed their lives to oppose the naked violence of Jim Crow in the South, they could not find similar courage to lend a hand in lifting the heavy weight of unemployment and structural inequality in northern cities. Fifty years later, the two Americas persist in cities across this country, including here in our mighty City of Newark. Indeed, King’s reference to an “ocean of material prosperity” describes the employment opportunities available now in Newark. A major transportation hub in the United States, Newark has one of the busiest airports and seaports in the country. We are home to major Fortune 500 businesses, hundreds of manufacturers, a large network of leading hospitals, and world-class research universities and cultural institutions. As a testament to Newark’s economy, the majority of the people employed here earn more than $40,000 each year. But this prosperity has not been shared by the majority of Newark residents. Newark, like most American cities of its kind, has suffered from an unfinished fight for greater democracy, a more perfect union—or as Dr. King would say, Newark still has a check marked “insufficient funds.” As a result, the poverty rate for Black residents of Newark is a striking 33 percent, more than double the national average for all races. This is part of a broader, troubling picture: Newark residents, incredibly, hold only 18 percent of all jobs in the city. The primary driver of poverty is unemployment. Among those living in poverty in Newark, 96 percent of them did not have a full-time job in the past year, and 69 percent did not receive any income from work. The economic struggles faced by Newark residents—by the father skipping a meal so his kids can have dinner, by the mother fearing she will never find a job that pays more than minimum wage, by the grandmother deciding between paying for medication or the heating bill—are felt in households in cities from around the country. It is because of their struggles that we are at a critical, urgent turning point in Newark, across New Jersey, and around the country. At this critical juncture in our nation’s history, on the eve of the presidential inauguration after one of the most divisive and racially charged presidential campaigns in history, our cities hold incredible promise to advance an agenda that unites us, and to incubate progressive solutions to finally bridging the two Americas. To do this, we must ensure that every person has access to economic opportunity through employment that pays a true living wage. This is the most direct way to confront poverty in our nation, and to bridge our class and race divides. Consistent with King’s vision of bridging the two Americas, this year the City of Newark, in powerful partnership with the New Jersey Institute for Social Justice, the Newark Alliance, Rutgers University–Newark, RWJBarnabas Health, Prudential, PSE&G, Panasonic North America, Audible.com, United Airlines, the Port Newark Container Terminal, the New Jersey Devils/Prudential Center, and a growing number of other anchor institutions and employers, will launch Newark 2020, an unprecedented jobs initiative to combat poverty by connecting unemployed Newark residents to meaningful, full-time work that pays a living wage. Our ambitious and achievable initial goal through Newark 2020 is to cut the unemployment gap between Newark and New Jersey in half by connecting 2,020 unemployed Newark residents to these jobs by 2020. Newark 2020’s ultimate charge is to ensure that the maximum possible number of Newark residents are competitive candidates and receive due consideration for positions in each industry. Collectively, we embrace our shared vision of a community where every person who wants work can find it, and be paid a living wage. Together we built consensus about the path forward to achieve this objective through improved training and workforce development, innovation, expanded educational opportunities, and removing barriers to employment. Similar to the intentional way in which the federal government once crafted a Marshall Plan for our cities, we are working closely with our partners to strengthen and support a system that includes training and hiring pathways to the growing opportunities in our city. In this work, we benefited from the lessons learned by other partner cities—like Baltimore, Cleveland, Detroit, and New Orleans—seeking to forge economic equality in their communities through jobs. 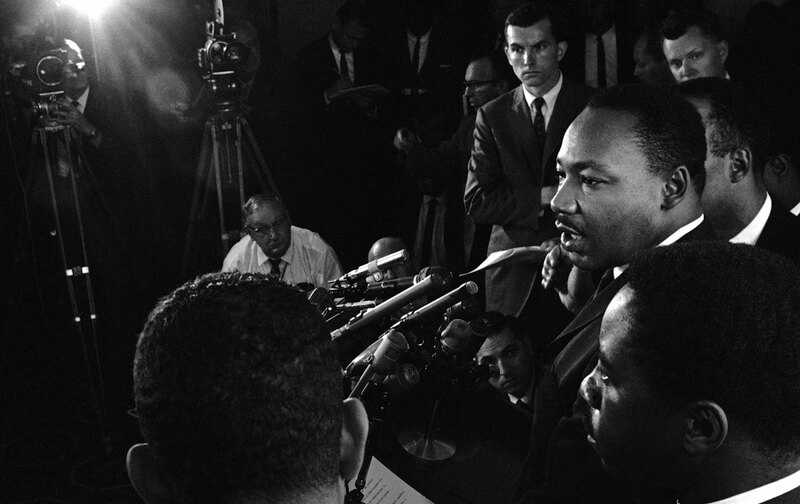 This remains the great unfinished business of the civil-rights movement: bridging the two Americas by empowering people through economic equality and mobility. And that’s what this moment requires of us: that we embrace King’s vision of social justice and economic equality, and commit to bending our neighborhoods toward the beloved community. Together, in this 50th anniversary year, we will work to bridge the two Americas by creating a pipeline for powerfully promoting local hiring so that all residents have the opportunity to earn a living, sufficient to support their families in this new economy, because we believe as King did that everyone has a right to a job and a right to earn a living wage. Ras J. BarakaTwitterRas J. Baraka is the 40th mayor of the City of Newark. Ryan P. HaygoodTwitterRyan P. Haygood, one of the nation’s leading civil rights attorneys, is CEO and president of the New Jersey Institute for Social Justice.